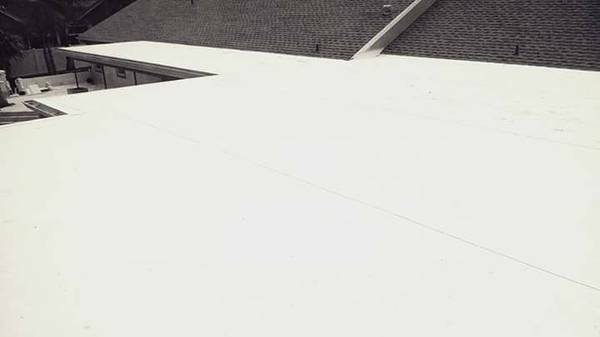 If you have a flat or low sloped roof and are looking for a single-ply roofing system that is energy efficient and durable then you may want to consider a TPO roofing system. TPO roofing systems are known to have the benefits of PVC roofing systems and EPDM roofing systems without the deficiencies and added expense. This means that TPO roofing systems are just as Heat-resistant and UV resistant as an EPDM roof and can also be heat welded like the PVC roofing systems. As with any roofing system, TPO roofs do have their drawbacks primarily being that they are new to the market being introduced in the early 1990s. As with most new materials, market research is still being conducted and imperfections of the roofing system is still being ironed out. What is a TPO Roofing System? TPO stands for Thermoplastic Polyolefin. The first TPO roofing systems was introduce to the market in the early 1990s as a more economical and efficient roofing system than the PVC roofing systems and EPDM roofing systems. TPO is a thermoplastic polyolefin single-ply membrane composed of three layers. These three layers are the TPO polymer base, polyester reinforced fabric center also know as scrim, and thermoplastic polyolefin compounded top ply. In the TPO manufacturing process the most common fillers used are fiberglass, talc, carbon fiber, metal oxy sulfate, and wollastonite. The most common rubbers used in the TPO manufacturing process are ethylene-propylene rubber and EPDM. What are the Benefits of a TPO Roof? One of the benefits of a TPO roof is that they are more economical than their competing roof systems such as PVC. TPO roofing systems offer the same benefits as the more expensive roofing systems such as being heat weldable, and energy efficient but at a reasonable cost. TPO roofing systems can fit many types of roofs and roof slopes. TPO roofs also come in different colors such as white, light grey, and black while still remaining energy efficient. With a TPO roof you won’t be required to have a white roof to have an energy efficient roof. TPO roofing systems are resident mold, dirt and debris accumulation, tears and punctures. TPO is also very flexible and adjust as a home or building settles without compromising the roof. TPO roofs can also handle the thermal expansion and contractions of buildings better than other single-ply roofing systems. TPO roofing systems and not very difficult to install. TPO is light weight and comes in wide rolls so the material is easy to maneuver and there are less seams to be welded. This ease of installation transfers the savings in the cost of labor to the customer. The energy efficiency of TPO roofs is attractive to many customers for many reasons including a lower electric bill and a smaller carbon footprint. The TPO white reflective surface exceeds the EPA’s energy star requirements and the white, tan, and grey surfaces are listed with the Cool Roof Rating Council. If you are looking to keep your home cool while reducing your energy cost then a TPO roof might be the roof for you. What are the disadvantages of a TPO roof? TPO roofing systems have only been widely used since around 2005 so there is still a lot of research and experimentation taking place trying to find the optimal chemical formula that provides the longest lasting material while also maintaining affordability. This has been a challenge for many manufactures and there have been documented cases of seam failure, and membranes curling and/or cracking. Newer formulas and improved membranes have been tested but at this point there has not been enough time to know just how long these newer TPO membranes will last. When having a TPO roof installed it is recommended to use materials from a manufacturer who has been around for a while. sed risk of solar loads that are beyond “normal” it is recommended to question the manufacturer about their product durability in these situations or have a different roofing material installed that can withstand higher temperatures.